Iron Mountain partnered with its insurance provider, Zurich, to acquire and deploy GreenRoad across its entire fleet to help reduce insurance premiums. Iron Mountain embarked on a comprehensive risk assessment program for all commercial vehicle drivers, which reduced reported incidents by 71% and cut the cost of claims by 43% in just two years. To further this effort Iron Mountain partnered with its insurance provider, Zurich, to acquire and deploy GreenRoad across its entire fleet to help reduce insurance premiums by improving driver behavior and reducing overall risk exposure. After a wide search, Iron Mountain selected GreenRoad. 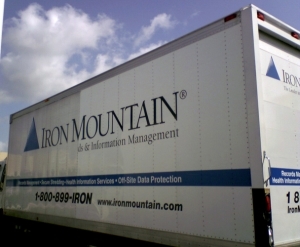 The fleet performance management solution allowed Iron Mountain to roll out the initiative quickly and allowed Iron Mountain to deploy the driver behavior system across all of their vehicles for full fleet visibility. After the initial pilot in 2010 Iron Mountain witnessed MPG averages increase by 14%; an 80% reduction in risky maneuvers; and an 80% reduction in incidents compared to the previous year. While using GreenRoad’s service over a ten-month period in 2010 the company submitted just three minor insurance claims. After achieving a 15% MPG improvement across the fleet, the company has also implemented GreenRoad’s new Idling Performance Management feature, which typically delivers a 2 – 5% drop in fuel consumption. By applying sophisticated filtering to the unavoidable idling that occurs at traffic lights and junctions, it quickly identifies specific drivers, vehicles, or trips that negatively impact fuel performance based on client-defined policy thresholds. GreenRoad’s Idling Performance Management service went live in late February 2011 in 430 Iron Mountain HGVs and LCVs across 30 depots in the UK and Ireland and is now used by 500 plus drivers. Results to date continue to show a reduction of vehicle incidents by 13% and own damage costs down by 40%. Iron Mountain was one of the first to also deploy GreenRoad’s optional Posted Speed Performance feature across its entire fleet to highlight any speed violations by drivers.